Fire wire flexible grilling skewer solves many of the problems with cooking on straight skewers, and wooden skewers are hard to handle. Fire wire's flexible stainless steel cable tips are designed to stay cool allowing grillers to remove food from grill without tools. 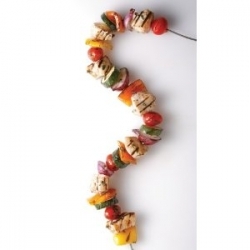 The fire wire is 22'' in length so it holds more food than traditional skewers. Dishwasher safe and won't rust.